Toronto, Ont. – The Canadian Hockey League today announced the week two edition of the CHL Top-10 Rankings for the 2018-19 season. The weekly rankings of the CHL’s Top-10 teams are selected by a panel of National Hockey League scouts. 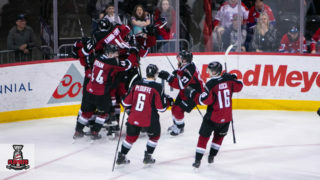 For a second-straight week, the Lethbridge Hurricanes remained among the top three teams in the CHL, coming in at number three. The Hurricanes’ season began with a 5-2 loss at home to the Medicine Hat Tigers, before they bounced back with a 4-2 win over those same Tigers a night later in Medicine Hat. Through the team’s first two games, Taylor Ross leads the Hurricanes with four points (1G-3A). The Hurricanes are set to begin a two-game swing through the East Division this weekend, taking on the Regina Pats Friday, September 28 (7:00 p.m. MT) before meeting up with the Brandon Wheat Kings at Westoba Place on Saturday, September 29 (7:30 p.m. MT). The Spokane Chiefs are the next highest ranked WHL team, occupying spot seven on this week’s list. The Chiefs took a 6-1 loss at the hands of the Tri-City Americans in their lone contest of the weekend. Overage forward Riley Woods scored the Chiefs’ lone goal in the contest. The Chiefs are on the road against the Kootenay ICE Friday, September 28 (7:00 p.m. MDT) before the two teams head south of the border and complete the home-and-home series Saturday, September 29 (7:05 p.m. PT) at the Spokane Veterans Memorial Arena. The Chiefs’ weekend will conclude with a trip to the Langley Events Centre that will see them take on the Vancouver Giants Sunday, September 30 (4:00 p.m. PT). Holding down spot eight in the rankings were the Giants, who moved up from their honourable mention in the pre-season rankings to stand among the best in the CHL. 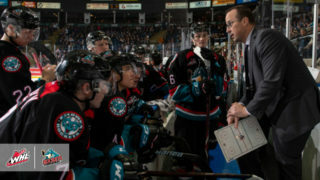 The start to the 2018-19 WHL Regular Season provided the Giants with a pair of wins over the defending Western Conference Champion Everett Silvertips. With coming by 3-1 scores, the Giants moved into a seven-way tie for first with a perfect 2-0-0-0 record, with them one of 10 remaining teams yet to lose a game in regulation this season. Goaltender David Tendeck (Arizona Coyotes) was most impressive in the pair of games, posting a 1.00 goals-against-average and a 0.966 save percentage after stopping 57 of 59 shots sent his way. 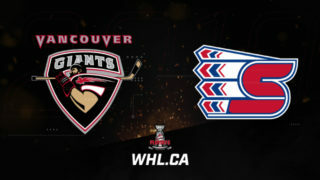 Up next for the Giants is a pair of home games against U.S. Division clubs, beginning Friday, September 28 (7:30 p.m. PT) against the Seattle Thunderbirds followed by the aforementioned Sunday date against the Chiefs. Rounding out the CHL Top 10 Rankings this week were the Saskatoon Blades, who began their season with a pair of wins over the Swift Current Broncos, earning 2-1 and 8-0 victories. 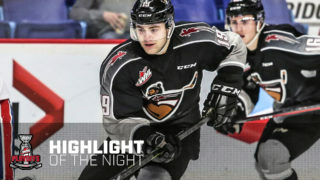 The team was led by WHL On the Run Player of the Week and CHL Player of the Week Kirby Dach. The 2019 NHL Draft prospect tallied seven points (3G-4A) in the two games to lead his club to victory. The Blades will look to keep that momentum going when they host the Medicine Hat Tigers on Saturday, September 29 (7:00 p.m MT). 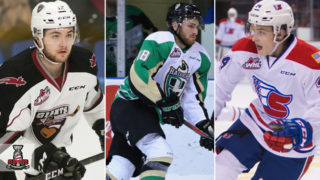 Earning an honourable mention this week were the Prince Albert Raiders, who also joined a list of teams to start 2-0 in the 2018-19 WHL Regular Season. 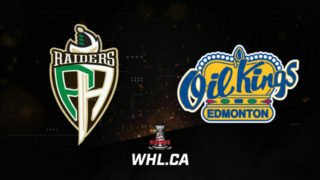 The Raiders secured both of their victories over a fierce rival, ending a 15-game losing streak against the Regina Pats in their season-opening contest and completing the home-and-home sweep a night later in the Queen City. Leading the team in scoring through two games is forward Cole Fonstad (Montreal Canadiens), whose five points (2G-3A) have him tied for third in league scoring. The Raiders are in for a tough weekend, beginning with hosting the Tigers on Friday, September 28 (7:00 p.m. MT). #WHLOpeningWeek action continues Wednesday, September 26, 2018 with a pair of games on the schedule and 23 more this coming weekend.